Not having the time, money or other resources required to travel long distances to enjoy a break does not mean that you have to relinquish your family vacation altogether. With a little research and creativity, you will likely find that there are plenty of things to do and see without even leaving your home town. This is important for families with children, as little ones can become bored quite quickly, needing activities and attention to enjoy their time away from school. This is also a great way to spend weekends at any time of year. 1. Botanical gardens are usually open to the public and are not open for profit. They are quick, easy and cost-effective for the entire family to visit. They showcase natural beauty and are usually set up to accommodate even young children without posing too many dangers. Enquire about lectures and classes being conducted during the school holidays for those that find this type of place particularly interesting. 2. Find out about local organic farms and take the children on a pre-arranged tour of one (or more) of these to educate them about the origin of their fruit, vegetables, meat and dairy products. Young ones will love milking a dairy cow or watching sheep get shorn. 3. If you live close to a regular farmers’ market, visit it as a family. Let the children choose some produce for their week’s meals, involving them more in the process and allowing them to see where their food comes from. 4. Plan a treasure hunt in a grocery store to convert a weekly chore into a fun activity. Give them clues as to what to find and where, and ensure that there is a worthwhile treasure at the end of their quest. This will take plenty of forethought and preparation but will prove to be worth it. Clues can include logos or slogans on the item’s packaging, a certain barcode, or a colour combination, for example. 5. Watch a local sports match, even if it is just at a nearby high school. The vibe and excitement is a fabulous way to pass a few free hours. 6. Incite the child in you and plan a family day at the local games arcade. Instead of ambling around waiting for the kids to finish their games, play along with them. They will love the quality time and be able to enjoy themselves without worrying that you are in a rush to get home. 7. Enjoy a family picnic in a local park, sports field, beach or forest. Pack all sorts of delicious delights and remember to take along an activity (such as a bat and ball or a board game). 8. Find out about local art, craft or music festivals and visit these, even if it is not something you would ordinarily do. A change makes for a valuable break. 9. Find an isolated spot in which you can plant some indigenous trees. This may work best at a local animal shelter or children’s home that needs and approves of your initiative. Teach youngsters about the importance of this vegetation and watch their delight as, year after year, they monitor the growth of “their” trees. Permission will definitely be required. 10. Take classes (art, pottery, jewellery making or cooking are all popular choices). If any or all of you need a boost, join the gym or take fitness classes together. 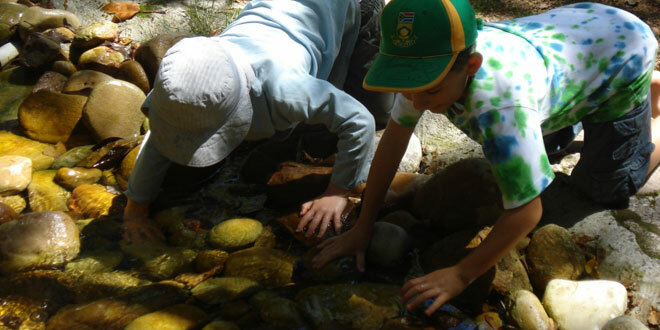 For families travelling Locally within South Africa you can find a huge selection of activities Things to Do in South Africa on SA-Venues.com and to find a kid-friendly place to stay, see Family-friendly accommodation where children of ALL ages are welcome. Also see South Africa Holiday Accommodation for other hotels and lodges, B&B and Inns that accept children from 6, 12 or 16 years upwards. Ha Ha Ha … I love the treasure hunt in the grocery store idea! I have been to a few farmers markets with the family. The kids always enjoy it and alot of them have a play area for them too, so they are entertained while we sit and enjoy a coffee or look through the stalls.